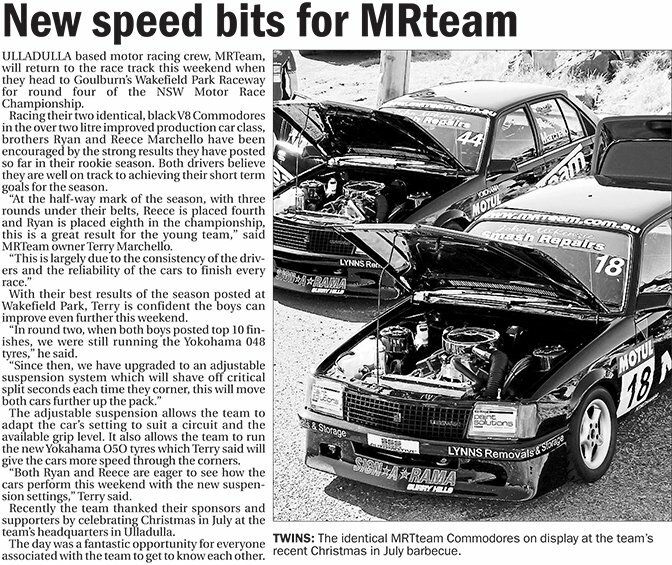 ULLADULLA based motor racing crew, MRTeam, will return to the race track this weekend when they head to Goulburn’s Wakefield Park Raceway for round four of the NSW Motor Race Championship. Racing their two identical, black V8 Commodores in the over two litre improved production car class, brothers Ryan and Reece Marchello have been encouraged by the strong results they have posted so far in their rookie season. Both drivers believe they are well on track to achieving their short term goals for the season. “At the half-way mark of the season, with three rounds under their belts, Reece is placed fourth and Ryan is placed eighth in the championship, this is a great result for the young team,” said MRTeam owner Terry Marchello. With their best results of the season posted at Wakefield Park, Terry is confident the boys can improve even further this weekend. “In round two, when both boys posted top 10 finishes, we were still running the Yokohama 048 tyres,” he said. The adjustable suspension allows the team to adapt the car’s setting to suit a circuit and the available grip level. It also allows the team to run the new Yokahama O5O tyres which Terry said will give the cars more speed through the corners. “Both Ryan and Reece are eager to see how the cars perform this weekend with the new suspension settings,” Terry said. Recently the team thanked their sponsors and supporters by celebrating Christmas in July at the team’s headquarters in Ulladulla. The day was a fantastic opportunity for everyone associated with the team to get to know each other.